Oh, won’t you be my neighbor? If it’s a beautiful day in your neighborhood, take advantage of the long summer days to spend time with the neighbors. Summer is the best season to get outside. When the weather is warm and the sun is shining being neighborly comes naturally. 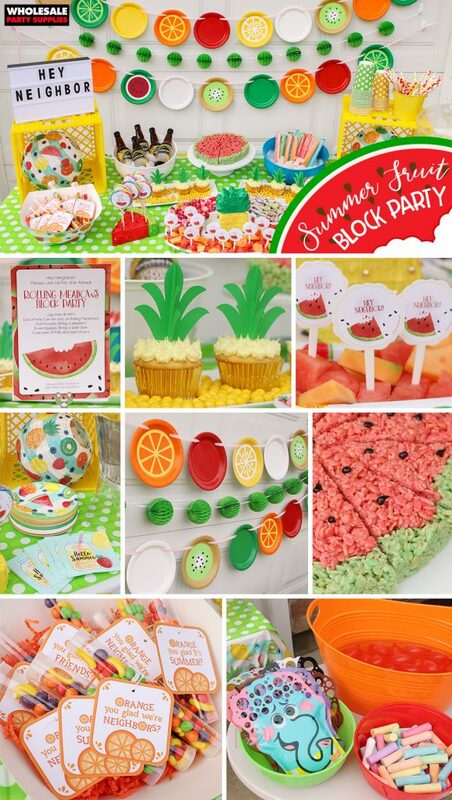 Why not gather all the local families and friends together for a fun summer block party! 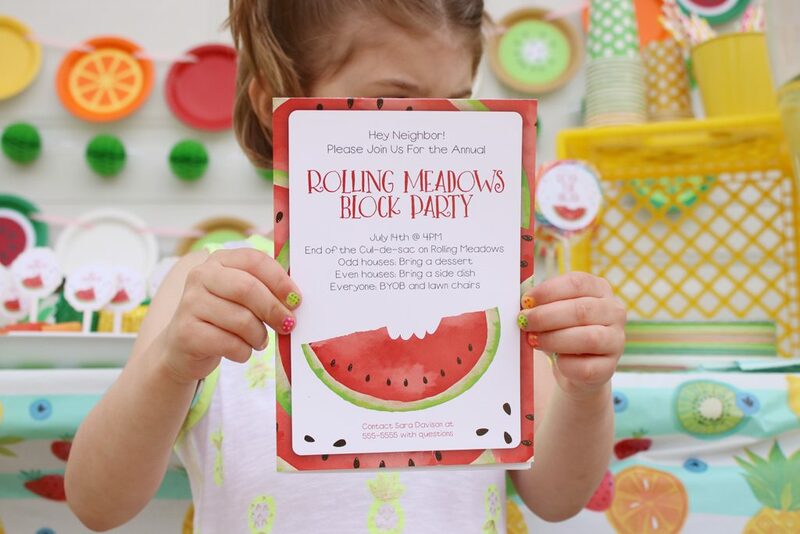 Break out all the summer fruit party décor and prepare the space for a potluck style party that’ll rock the block! With sidewalk chalk, water balloons and glow sticks your neighborhood is sure to be a flutter of excitement this sunny season! 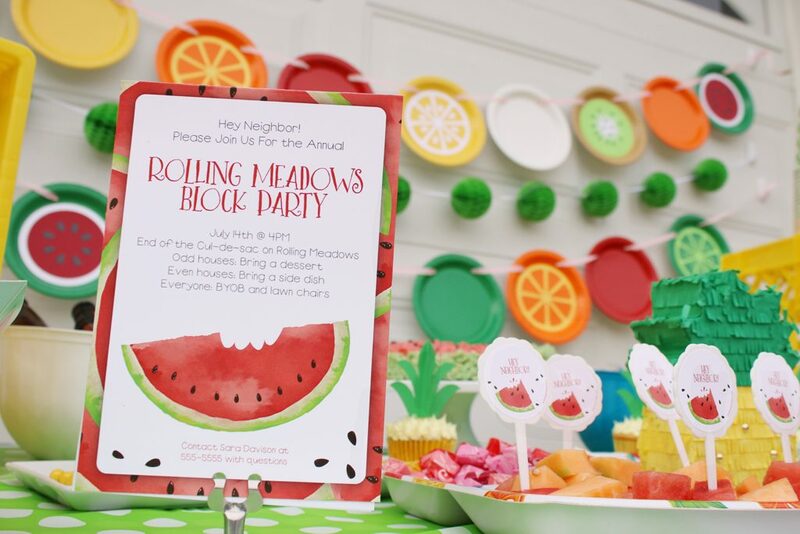 If your neighborhood doesn’t have a common park or cul-de-sac, choose a few houses to be home base for the center of the action of your tutti fruity themed day. Slice up the fruit, slap on the sunscreen and get ready to mingle. This post was written, styled and shot by Tara at Spot of Tea Designs. 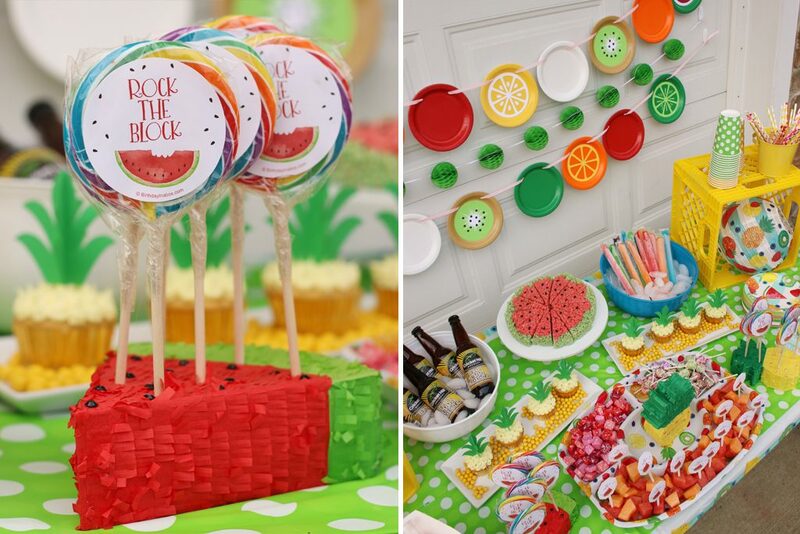 For parties big and small, she’s the one to call… or you could just stop by her blog for tons of DIY and party tips! Instead of going door to door with all the information neighbors need to know, drop a personalized invitation to their mailbox. Tip: to ensure you don’t have too many desserts or side dishes, assign people one of these categories based on their address. Your colorful party décor is sure to pop with your white garage door as the background. Drape your table icons of delicious summer fruit and citrus filled colors. Use command hooks to hang colorful garlands behind your tablescape. 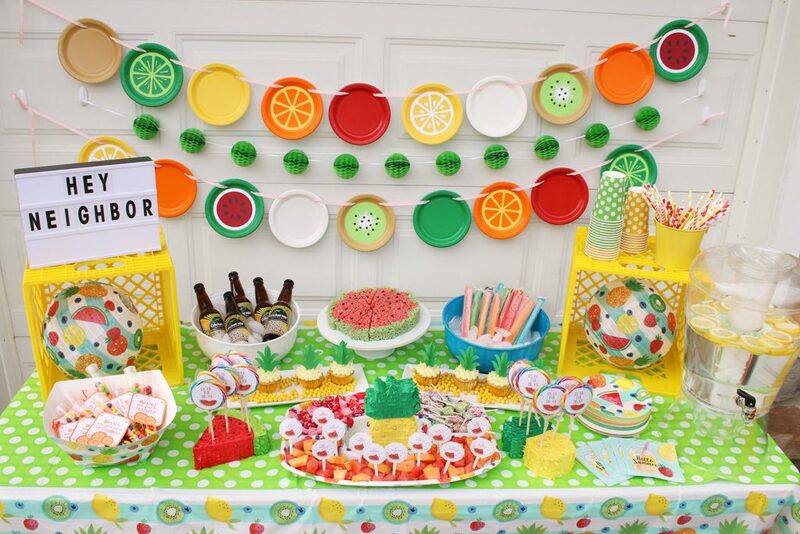 Mix honeycombs, a chain of pineapples and a DIY assortment of colorful fruit shapes to create a backdrop! Grab the free printable templates learn how to create this sweet summer garland! 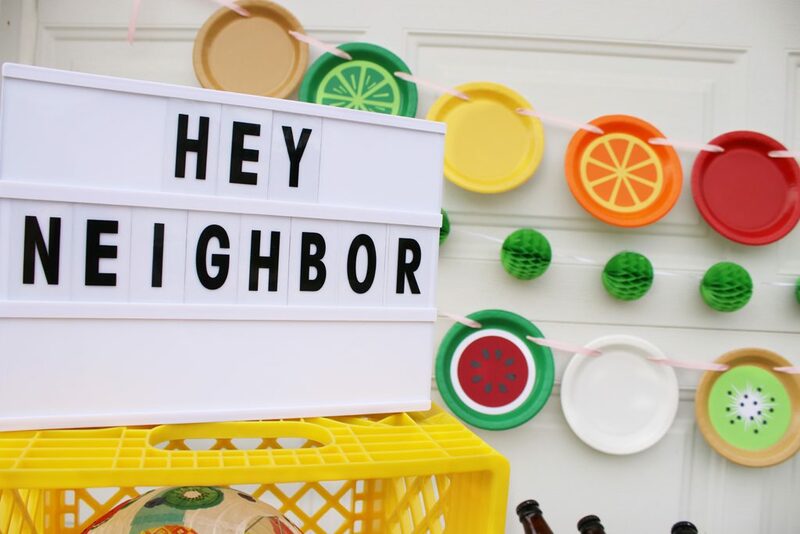 Make sure everyone knows your neighborly with a lightbox stating a clever message! 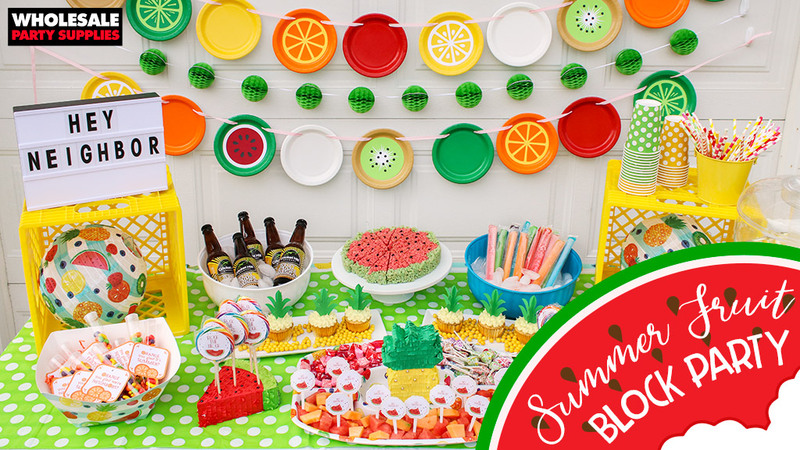 Keep the tableware happy and festive and full of all those summertime feels! 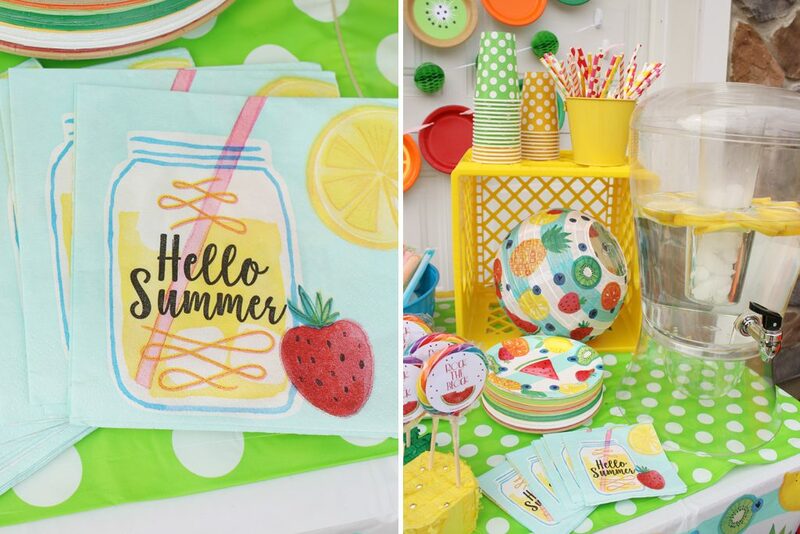 Accent your summer themed plates and napkins with bright and colorful cups and straws. If you’re an even numbered house and you were assigned desserts, why not make your sweet treats look even, well… SWEETER, with some faux fruit looks? 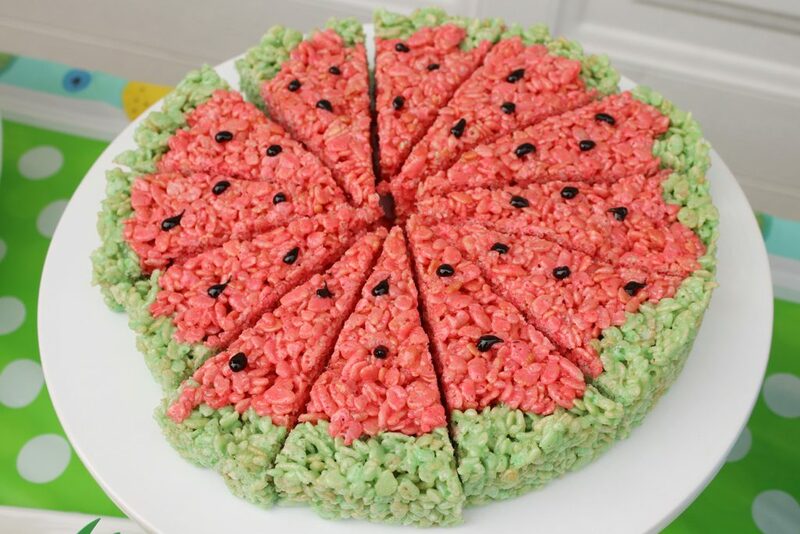 Rice Krispies Treats are even more munchable when they look like a fresh slice of watermelon! 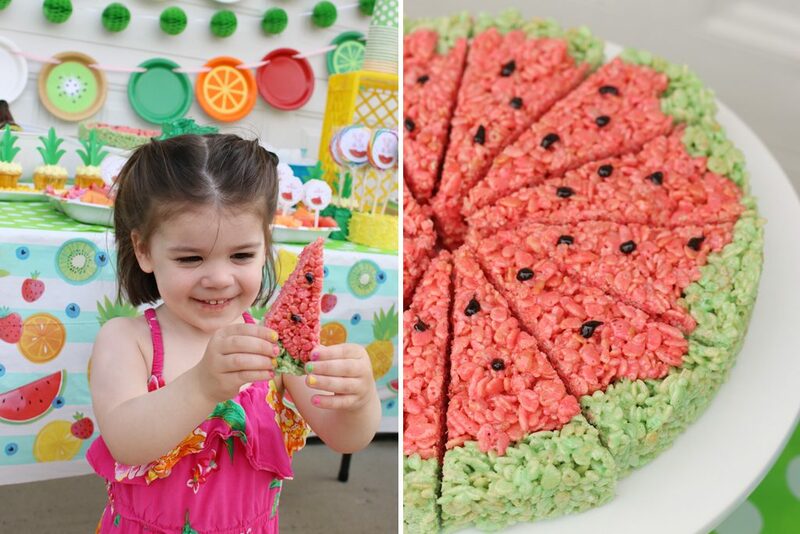 Food coloring, black icing and a round cake pan help to make these faux fruit treats for your neighborhood get together. 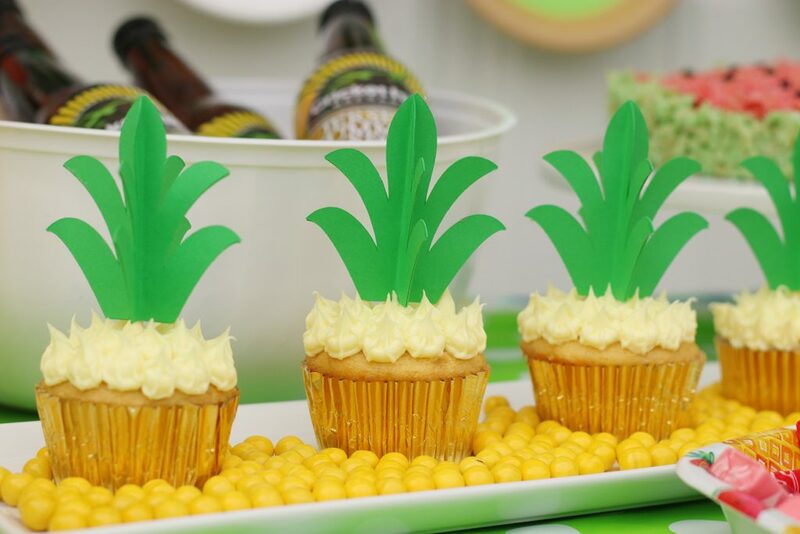 Break out your star tip for your pastry icing bag and cut up some 3D paper toppers to turn homemade cupcakes into cute pineapples cupcakes for your dessert buffet. 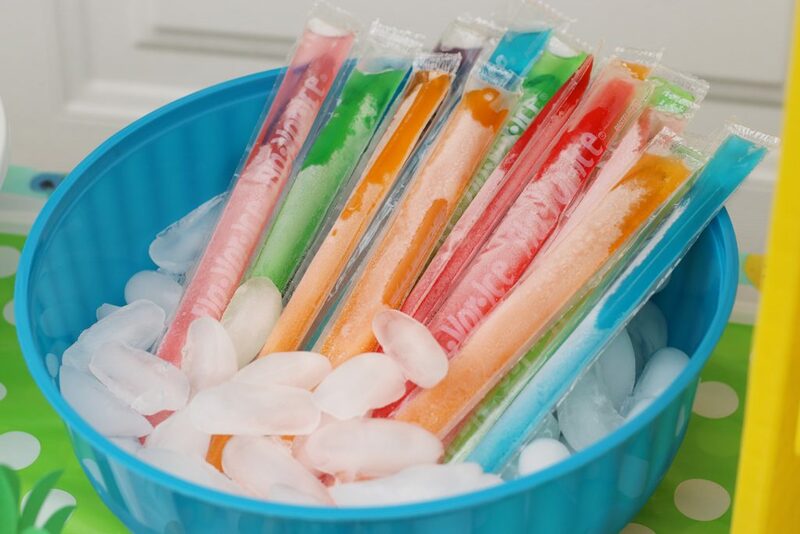 Cool them down with some colorful popsicles perfectly chilled on ice. 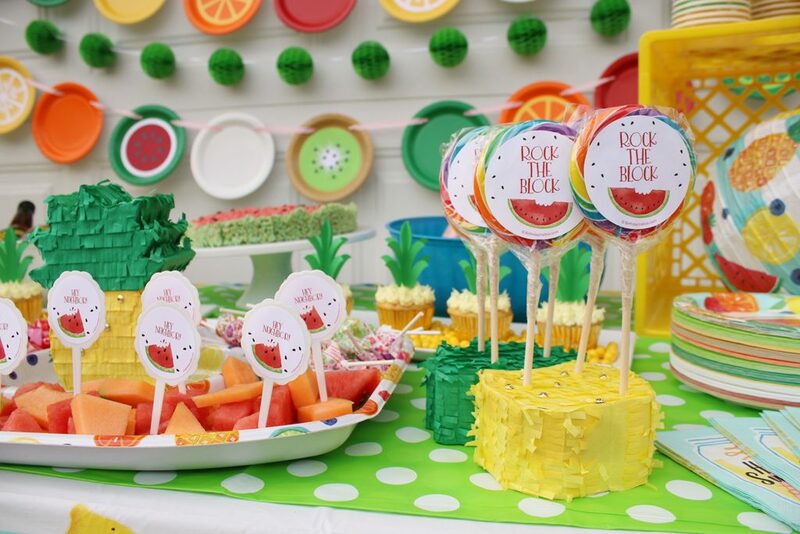 Slap some “Rock the block” personalized stickers to rainbow lollipops and challenge friends to take a lick! Tip: Turn coordinating decorations into lollipop stands with the help of some floral foam inserted inside and a few holes on top. 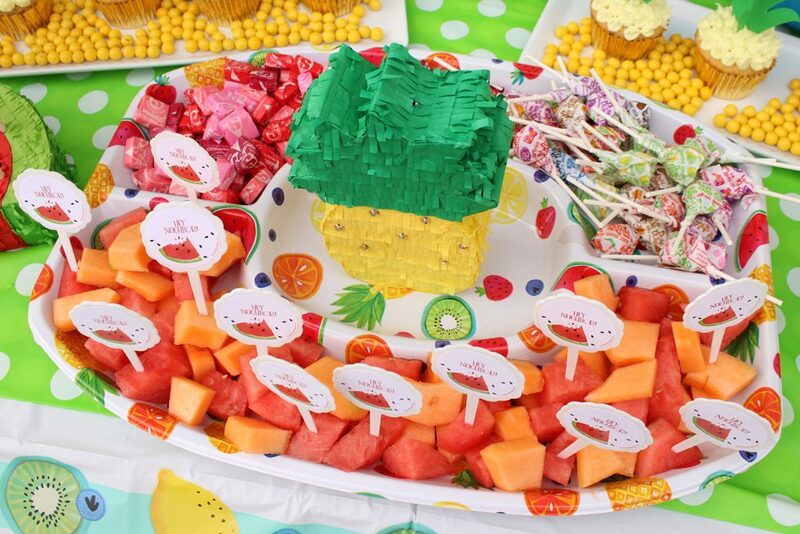 Keep it sweet and cool with some cut up fruit and easy to grab wrapped candy snacks. 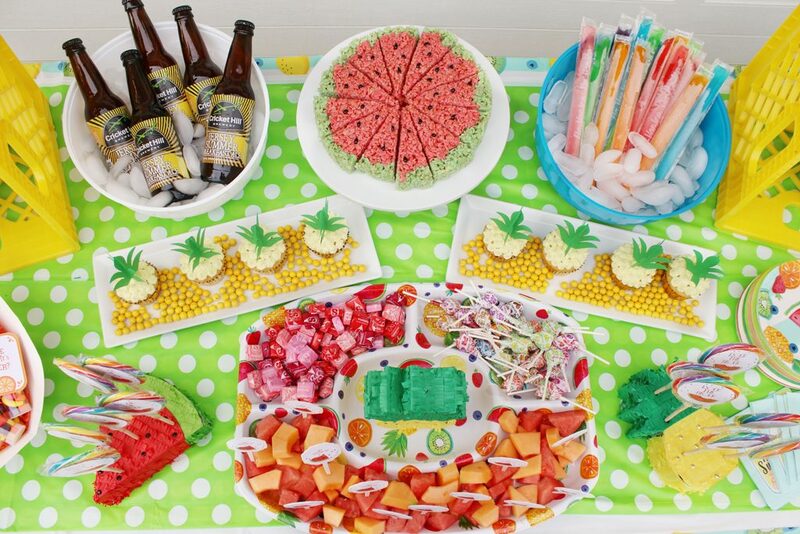 Use this colorful sectional fruit plate to keep them all separated out. 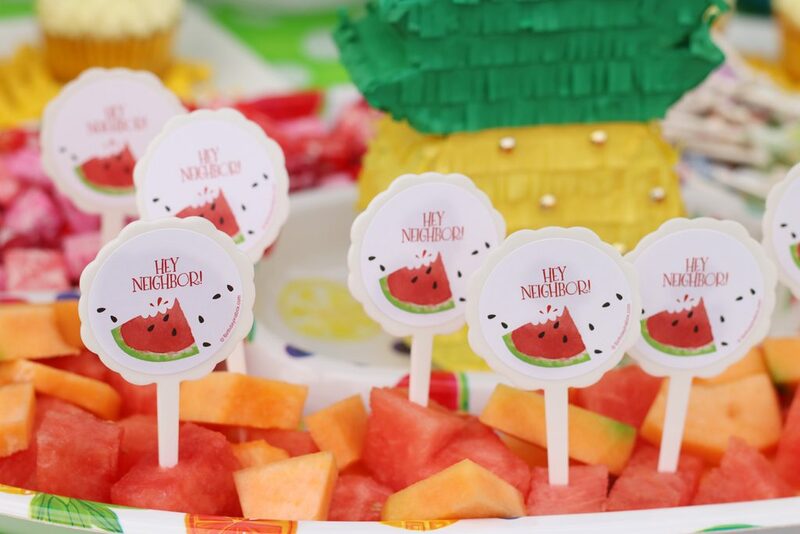 Tip: add personalized stickers to cupcake picks turn them into toothpicks for your fruit platter. 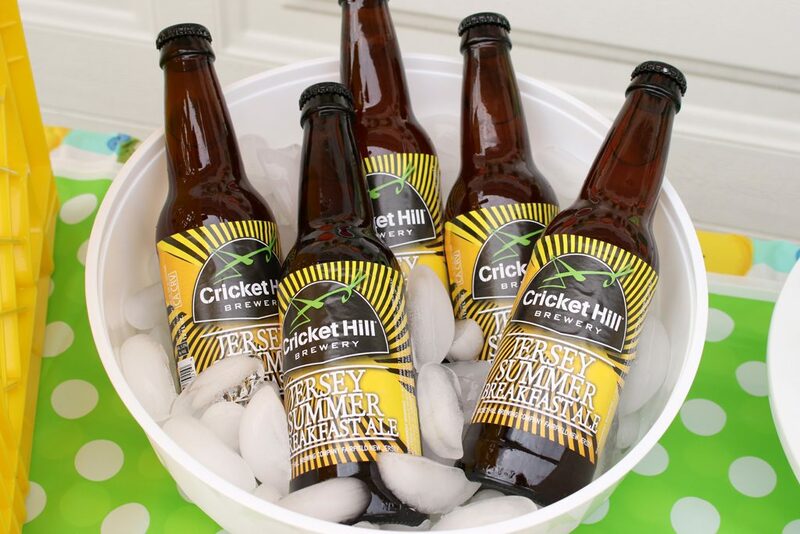 Even though the invitation says everyone is to BYOB, you can always offer neighbors a cold brewski, especially one that’s named for the season. 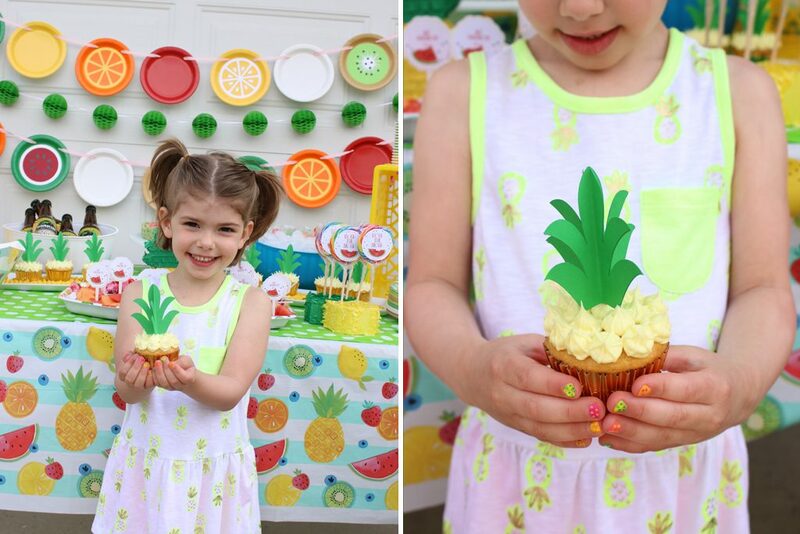 If you want to get into the spirit even further, blow up a fun inflatable pineapple cooler! 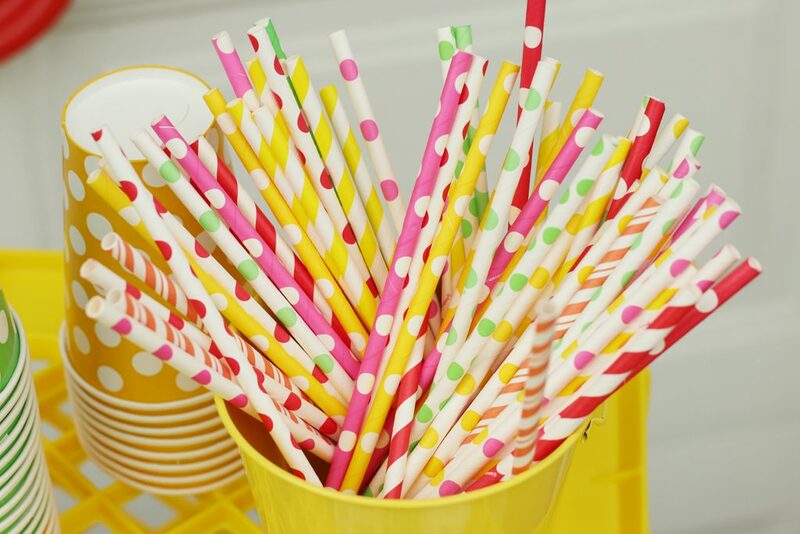 For those who might not yet be 21, display a big container of flavored water with colorful cups and straws to hydrate them after all that active play. 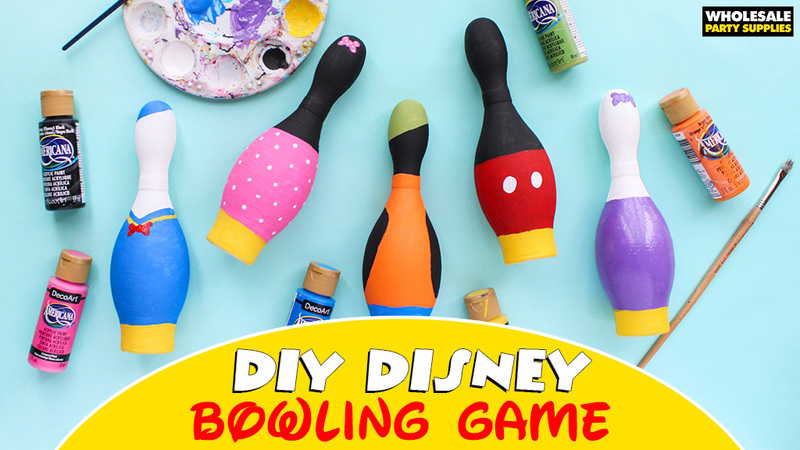 Plan to take advantage of beautiful summer weather at your neighborhood block party and cover your lawn with your favorite backyard games. 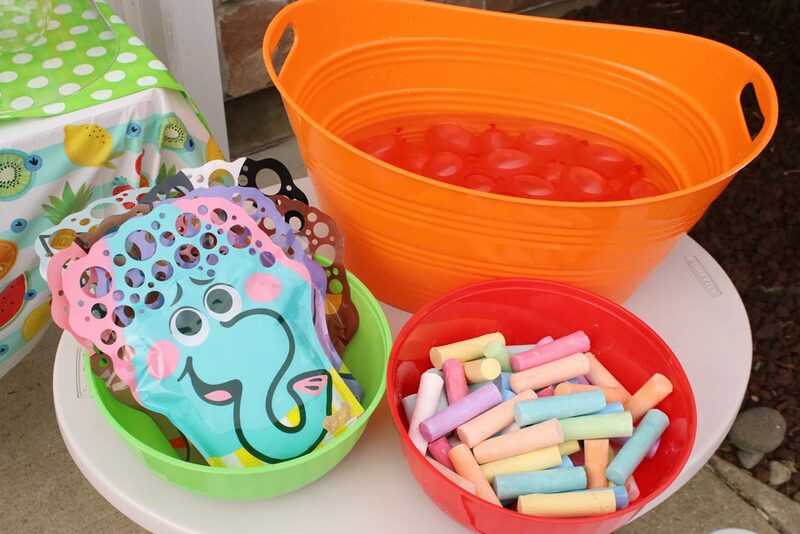 Encourage community spirit with buckets of summer’s favorite outdoor activity props, like water balloons, sidewalk chalk, bubble gloves and glow sticks! Tip: corral them in colorful buckets on shorter tables for easy reach by little hands passing through your yard. 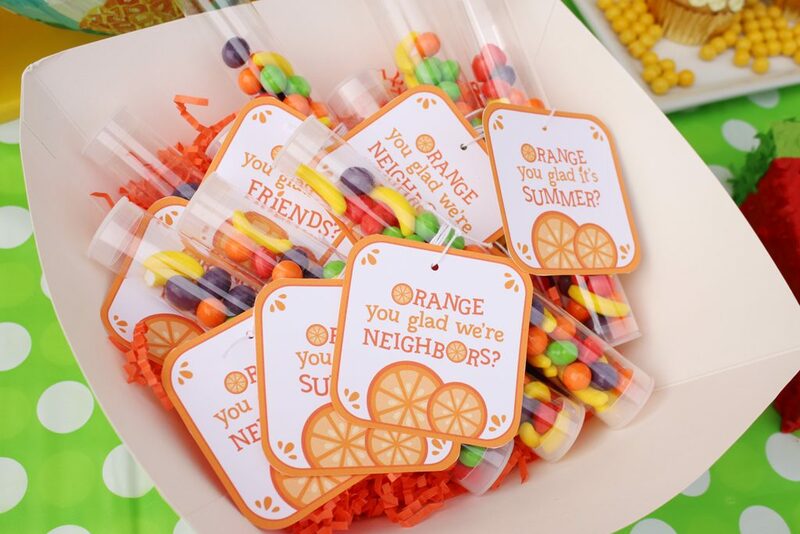 While favors aren’t necessary or traditional for a neighborhood block party, it’s always nice to send someone home with a little sweet treat to remember you by. 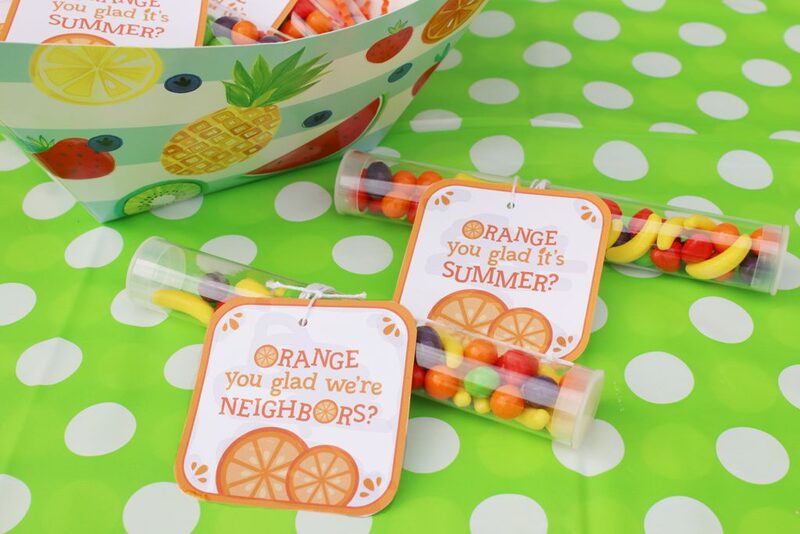 Attach a custom “orange you glad we’re neighbors” favor tag to a tube of RUNTS mini fruit candies and put them out on display in a coordinating paper bowl for easy reach.